On January 5th, APACC hosted a session Susie Cambria of Bridges, Inc., who provided a free training on how the DC budget gets created and how residents and organizations can make sure their voices get heard. Susie is a seasoned budget expert who literally wrote the book on getting the DC government to listen to your message. Learn the budget process and timeline so that you know when you as a resident can get involved and influence decision-making. 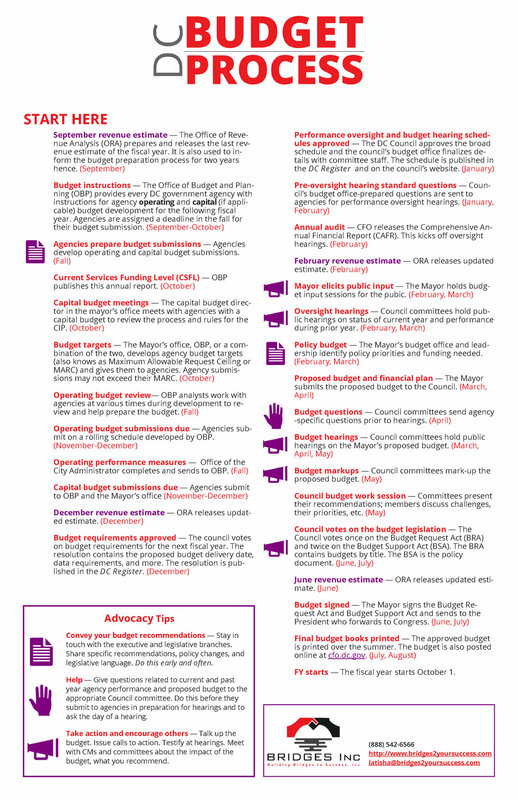 Bridges, Inc. created this helpful timeline of the DC budget-making process. Items with the megaphone next to them are opportunities to make your voice heard. Download the PDF here. Identify if the issue you care about is actually something to be solved by the budget. There is a difference between budget problems and operational problems (e.g. the agency may have the money but not do an adequate job at something). For example, is the illegal dumping in your neighborhood still there because an existing program doesn’t have enough funds to operate in your neighborhood? Make sure that your complaint has a budget solution, and think about suggestions that your councilmembers are most likely to listen to. Write your testimony ahead of time, print it out and make the font big and legible. It’s okay to read from a prepared statement. You can submit a statement for the record even if you can’t make the hearing. Hearings don’t always start on time, and they may go long depending on the number of people testifying - be prepared to be flexible. Success story: APACC advocated for more funding for Anacostia River cleanup last year. The cleanup of the Anacostia River is a priority for APACC, so when we noticed $5 million that had been removed from Fiscal Year 2018 for clean up efforts on the river, we reached out to residents of the neighborhoods next to the Anacostia. Several residents and organizations came out to testify at a budget hearing, and $4 million were restored to the budget line item. Part of our success came from turning out real people telling individual stories about how important the river was to them, but also because we were very active on social media before and after the hearing. Stay tuned for more information from APACC about the DC Budget and how you can get involved.